Here are some great places to go for your hiking, biking, and water skiing pleasures during the summer. There are many hiking trails into the Inyo National Forest with magnificent views. On these trails, you may discover mountain top views, crystal blue lakes, babbling brooks and streams, and quiet areas to relax. 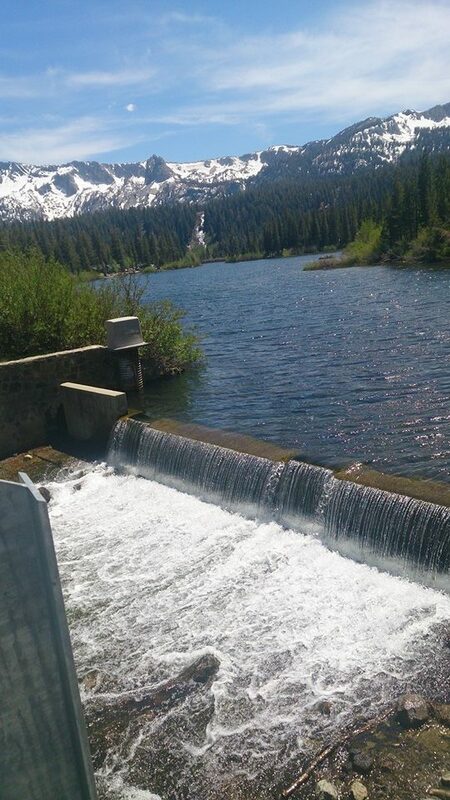 In the Sierras, there are day hikes, casual strolls to strenuous elevation changing hikes. You can also do overnight hikes but these require special permits, which have quotas for overnighters, so you need to get there early to get your permit. Lakes Basin Area: Off Lake Mary Road provides shorter trails near Lake George. Panorama Dome: The dome is an easy ½-mile hike that begins near the bridge of Twin Lakes. The trailhead is on Lake Mary Road past the turnoff to Twin Lakes. Rock Creek: Most of the trail is near a cold-water creek. Aspens, willows, and other foliage during an early October hike will show you spectacular colors of yellows, oranges, and reds. Devils Postpile National Monument (nps.gov/depo): A 0.4-mile hike leads Devils Postpile a unique geologic feature protected by the National Park Service. There are about eight miles of trails within the park. Make sure to bring plenty of water in the summer months. Shadow Lake and Lake Ediza: A three and a half to six mile: Take the turnoff to Agnew Meadows campground and from the trailhead parking lot, follow the signs for "Shadow Lake/River Trail.” You will want to start early because of the midday sun along the exposed switchbacks. Owens River Gorge: This area is a great place for watching the rock-climbing crowd. You can access the trails from Highway 395, ten miles north of Bishop at the Owens Gorge Pipeline Road. There is also great fishing and wildlife viewing here as well. Bottomless Pit (What a name! ): This 0.75-mile hike to the viewpoint is short and steep, which is why this is a moderate hike. You can access the trail from Tamarack; walk through the campground, over the bridge, following the road until you see the trailhead sign. There are more trails available as soon as the snow melts then there is time to enjoy before the next snow falls. One of the best areas to bike is at the Mammoth Mountain Bike Park. The second best place is Inyo National Forest. These two areas offer you single track trails and dirt roads for excellent riding experiences. Water-skiing and wake boarding remain favorite activities in Mammoth Lakes. You can water ski in crystal-clear lakes such as Topaz, Klondike, and Grant all open to powerboats and water-crafts. Klondike Lake is only three miles north of Big Pine and this small lake is a popular local spot for swimming, water-skiing, sailing and windsurfing. Klondike Lake is reached by a dirt road off US 395 0.7 mi north of Reynolds Rd. (there is no roadside sign; there is a left-hand turn pocket for those coming from the north). Topaz Lake: straddles the California-Nevada state line. Topaz is popular with boaters and water skiers who generally keep their distance from the anglers. Grant Lake: is the largest of the lakes. After 10:00 am, speedy watercraft may take to the lake, and sports such as water-skiing, wake boarding, and jet skiing may be enjoyed. Most of the shoreline is accessible to the public by unpaved roads that connect to both California Route 158 and U.S. 395. There are so many places to go and visit while being outdoors enjoying hiking, biking, and water skiing. To find out more about the area and your visit here, by coming to our Facebook page, contacting us, or giving us a call at (855) GO-MAGGIE. We can tell you more about the area you might call home.